The Mysterious Interloper - is it space junk? At 01:08:38 UT on this night an unknown satellite trails through the field of view. It's pretty faint. 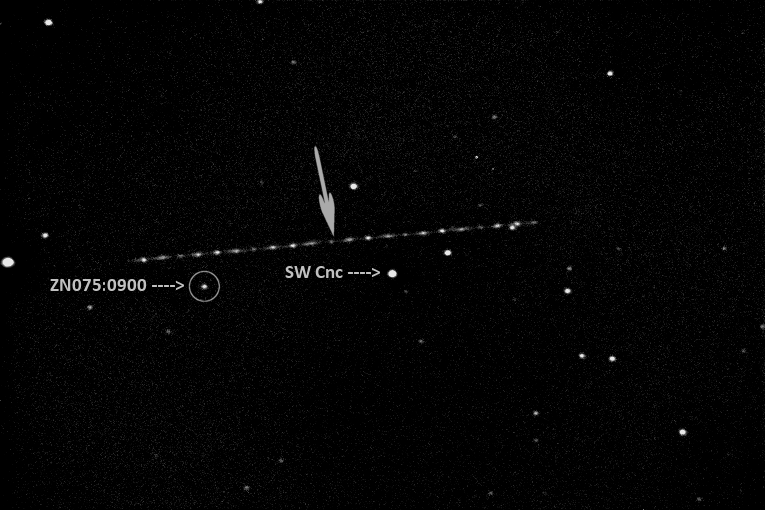 At the mid-point of the 50-second exposure (arrow), the satellite's position is RA= 09:09:04.07 and Dec= +09:36:17.2, and it's in the sky at alt= 57.092 degrees and az= 148.934 degrees. It's moving west to east (right to left) at a rate of 9.89 arcsec per sec. The brightest flashes compare with the 15.1 magnitude star, ZN075:0900 (circled). The 4-flash cycle in the satellite's image trail shows that, in the space of 50 seconds, the satellite has tumbled about 5½ times. How high is the satellite (it has to be above the Earth's shadow)? If we get all this, can we make an estimate of its size based on it's apparent magnitude?